Among the speakers, there was a general consensus that NATO member-states are realizing that regional instability and Chinese behavior are threats to their security and states–especially France, the United Kingdom and Canada–are taking action. But what that action will be and how it will be coordinated remains generally unknown. There was also a healthy discussion regarding the potential role of NATO itself in future Asian dynamics. • Program: A 6:30 p.m.-7:30 p.m. reception featured a light meal, drinks, and excellent conversation. 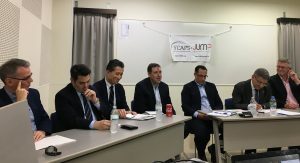 The YCAPS-JUMP Seminar began at 7:30 p.m.
• When: October 10, 2018, 6:30 p.m. to 9 p.m.
• Venue Access: The Fussa Citizen’s Hall is a 6 minute walk from Ushihama station (Chuo/Ome line). There was free parking in the large covered garage near the corner of Route 16 and the Yokota Supply Gate. Transportation from Yokosuka was provided for those who contact info@ycaps.org before October 5. • RSVP to info@YCAPS.org encouraged, but not required. Capt Paul Casson, Royal Navy, is the British Defence Attaché in Tokyo, having just arrived from studying International Relations at the Royal College of Defence Studies. His past career has seen operational deployments at sea and in Afghanistan, and he was most recently to UK MoD Project Manager for the Queen Elizabeth Class aircraft carriers being constructed in Scotland. Capt. Keizo Kitagawa, Japan Maritime Self Defense Force, is the Director of the Strategic Studies Office the JMSDF Command and Staff College. He previously served as Japan’s Defence Attache in London and holds a PhD from Keio University. Dr. Garren Mulloy is an Associate Professor at Daito Bunka University in Japan. His Ph.D. (Newcastle University) focused on Japan Self-Defense Forces’ overseas operations, and his research has covered Japanese and Asian security, international peace operations, defence reform, military-related history, and comparing memories and memorialisations of war in Britain and Japan. Dr. Stephen Nagy is a Senior Associate Professor in the Department of Politics and International Studies at the International Christian University. Since, December 2017, he has also served as a Distinguish Fellow for the Asia Pacific Foundation (AFP) of Canada. 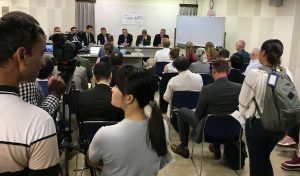 AFP is a Canadian think tank that focuses on Asia. Capt. Christophe Pipolo is the French Defense Attache serving in Tokyo. His distinguished career has included several posts dealing with top-level strategic issues and he is a graduate of Japan’s National Institute of Defense Studies. Tony Andriotis is Counsel at the law firm of Hughes Hubbard & Reed, President of the Greek Chamber of Commerce of Japan, and a member of the European Business Counsel’s Board of Governors. He frequently writes and lectures on issues regarding international dispute resolution, and is an Adjunct Professor of Law at the Tokyo Campus of Temple Law School and an Adjunct Lecturer at Keio Law School.